We won't get tired of stressing the importance of music during the First World War. If on one hand we find some great composers writing and orchestrating after the war, on the other we have the boundless universe of war songs generated during the war and coming from the hell of trenches. Many wrote about their importance and direct action on the spirit and morale of the troops and it’s not hard to believe them when framing the conflict as the “singing war”. (Some could even think of opening a new season of studies comparing the songs of the First World War, the "singing war" and the "silence" of the Second World War.) It’s not our intention today to write about La leggenda del Piave, known as La canzone del Piave (national anthem between 1943 and 1946), probably the most renowned Italian patriotic song, whose meaning played a strategic role in the national history not only during but also after the World War I. We rather focus on with a book that the poet and novelist Piero Jahier assembled starting from soldier songs. 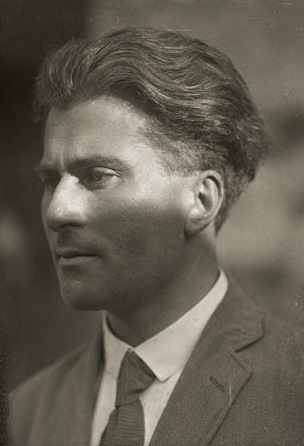 Jahier (1884-1966) was a volunteer during the World War I and worked also in the making of the trench newspaper L’Astico, when he started collecting all these songs. His book entitled Con me e con gli alpini (With me and with the alpine troops) came out in 1920 is a key-book if your wish is to understand the impact of the Great War on the generation of Italian intellectuals that favoured the war. 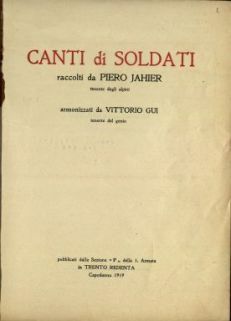 The book Canti di soldati is one of the results of his experience at the front and was published immediately after the end of the war in 1919 with the pseudonym of "barba Piero" and thanks to the work of harmonization of Vittorio Gui. In Jahier’s introduction we learn the only criterion used to select these songs, which was basically a criterion of popularity among the troops. The merging of soldier and popular songs or pieces of grand opera is the peculiarity of this book, a real rarity in the Italian history of popular music. At the beginning we read “Sono italiano / e se non canto moro” (I’m from Italy / and if I don’t sing I am going to die). Here follows a list of the songs that the readers can find inside this precious book (as you can notice, not all songs belong the World War One period but go back to the Nineteenth Century): Inno di Garibaldi; All'armi! all'armi! Ondeggiano; Inno di Mameli; Inno di Oberdan; Canzone garibaldina, La Marseillaise, Dans le jardin, God save the King, Tipperary; Coro del Nabucco; Coro dei Lombardi; Inno degli sciatori; Rivista al corredo; 'O surdato 'nnamurato; Addio mia bella, addio; Licenza; Lettera, Stornelli dell'artiglieria; Canzone del bersagliere; E la violetta; I tuoi capelli; La sveglia degl'imboscati; Monte Rosso e Monte Nero; Come porti i capelli bella bionda; Arditi; Inno degli Alpini; Sul cappello che noi portiamo; Emigranti; O Dio del cielo; O Tirolesi mandeme a casa; Se te tocco; Reclute; Il 29 giugno; Il mio bene l'è andà via; Dove sei stato mio bell'alpino; Il mazzolin di fiori; Il testamento del maresciallo; La settimana della Leggera; Gobo so pare; Scherzo sulla morosa; L'è ben ver; Ai prèat la biele stele; In cil'ejè une stele; Ce bielis maninis; Ti ricuardistu ninine, dis-al; Olin bevi; O ce biel; O ce biel lusor di lune; Se savessis fantacinis; Sdrindulàile; Cheste viole.